I love Sicily, the food, the landscapes and the people, especially my Sicilian hubby! This Sicilian pesto pasta meal kit is full of typical Sicilian flavours! For my hubby it was a real taste of home! For me it reminded me so much of the wonderful holidays I have spent there! I love pesto pasta, don’t you? When I first moved to Italy, I lived alone in a tiny one roomed apartment with no kitchen to speak of! My staple meal was ready-made pesto and pasta. I loved it! I mean you can have dinner on the table in the time it takes to boil the pasta and cook it. There’s nothing to prepare and only a couple of pans and plates to wash after. AND it’s so much better for you than a frozen ready-made meal or fast food take away. Fast- forward to today, I still love pasta with pesto. In fact, pesto has become a staple in my house because I also use it as a dip, on bruschetta , on pizza and even in cooking fish or chicken. However, I now often make the pesto myself. I love trying different ingredients in the recipe. There are already quite a number of pesto recipes here on The Pasta Project. Rocket pesto, radicchio pesto and olive pesto are among my favourites! Even though I love homemade pesto, I won’t turn my nose up at a yummy ready-made pesto, especially when it’s made with ingredients I can’t easily find myself. 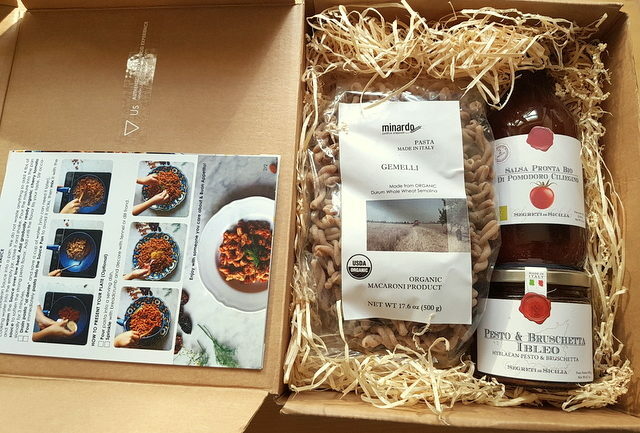 So, when I was sent this Sicilian pesto pasta meal kit from a company called Us Authentic Italian Experience to review, I was looking forward to trying it for a number of reasons. If you’d like to try this Sicilian pesto pasta meal kit just click on this link to check out the Us Authentic Italian Experience online shop. Use the coupon code THEPASTAPROJECT and get a 10% discount! Firstly, because the Hyblaean pesto (pesto Ibleo in Italian) in the pesto pasta meal kit sounded divine. It’s made with sundried tomatoes and almonds, plus extra virgin olive oil and wild fennel, both from the Hyblaean Mountain range area in South East Sicily. I have actually visited this part of Sicily a number of times and love it. Much of it is quite wild with lots of river gorges and canyons rich in history and vegetation. And I have even picked wild fennel there myself! Wild fennel is a popular ingredient in the Sicilian kitchen. Sicilians use it a lot in pasta dishes too. But, sadly, it is almost impossible to find or buy wild fennel here in Northern Italy! The combination of wild fennel, almonds, extra virgin olive oil and sun-dried tomatoes makes this pesto a fabulous example of typical Sicilian flavours. Flavours that are hard to recreate outside of Sicily. This is also a vegan pesto, no cheese or animal products in it! Sicilian organic ancient grains pasta. The second reason I was excited about this Sicilian pesto pasta meal kit was the pasta. 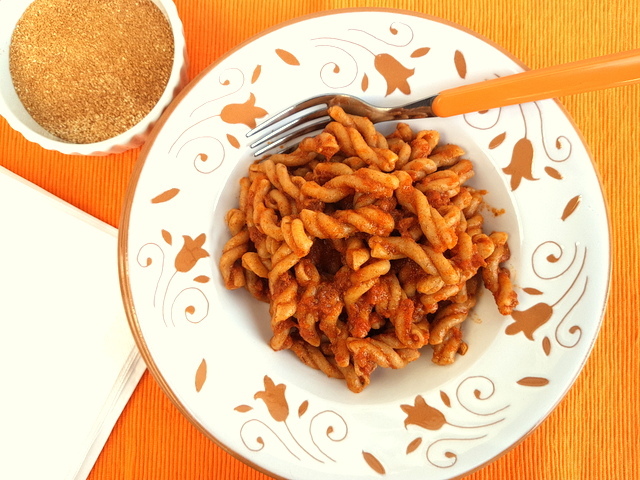 In this case, an organic ancient grain pasta from Sicily made from a type of wheat called Timilia. I’m really into these organic ancient grain pastas and am really happy that they are becoming more and more popular. In short, ancient or heritage grains are types of wheat that haven’t been modified to increase yields. And haven’t been sprayed with carcinogenic pesticides or herbicides! Heritage grains lost popularity in the past because production costs are higher but they are in demand again as more and more people choose healthier food options over cheap, mass produced products with low nutritional value. 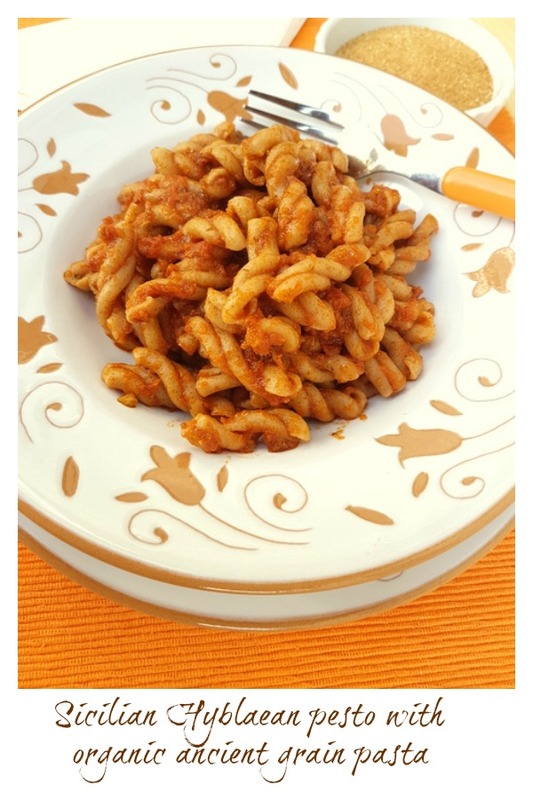 I have already published a few recipes with pasta made with ancient grains from Sicily. Take a look at this recipe for tortiglioni with broccoli and sausage. Timilia, or marzuolo wheat is a variety of summer wheat. You may also come across it called ‘tummina’. It was very widespread in Sicily before the Second World War and was even cultivated in Sicily by the Ancient Greeks who called it ‘trimeniaios ‘. Timilia flour is quite dark in colour and is used in the dough for Sicilian Castelvetrano black bread, a Slow Food Presidium, as well as for pasta. This type of organic durum wheat flour is stone milled which means it contains many trace elements of the wheat germ and bran and thus has a high level of protein and a low gluten index. In other words, Sicilian ancient grain pasta is pretty nutritious and good for you, plus is better tolerated by people with gluten intolerance! Sicilian pesto pasta meal kit. 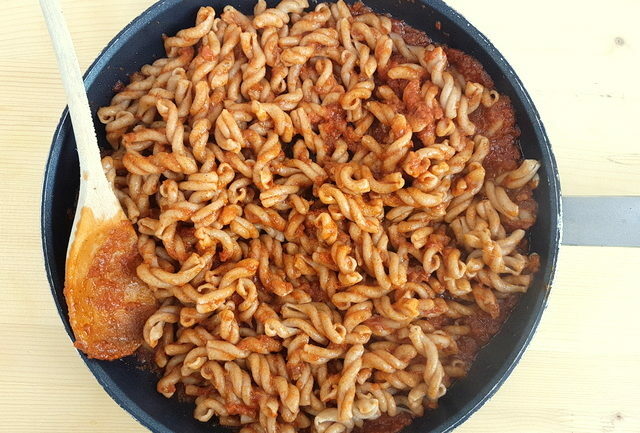 The Sicilian organic ancient grain pasta in my meal kit was gemelli.‘Gemelli’ means twins in Italian and this pasta shape belongs to the fusilli family. 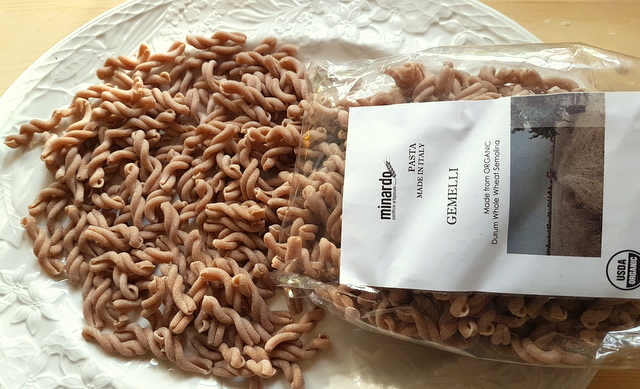 This is the first time I have posted about gemelli on The Pasta Project but I’m hoping to make some homemade gemelli soon. This organic ancient grain pasta was delicious with the Hyblaean pesto. Since both are quite rich and flavorful, they really complimented each other. This Sicilian pesto pasta kit also includes an organic cherry tomato sauce which I mixed together with the pesto to thin it out. This worked well with the pasta. Although, I did eat some of the pesto on its own on bread! Totally yum and great for bruschetta! 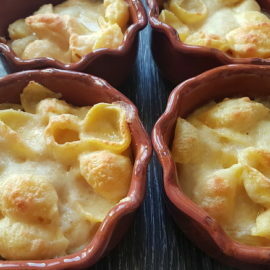 I also had some leftovers which I baked with mozzarella, that was yummy too! Leftovers baked with mozzarella! Yummy! My hubby and I both loved it! I loved this Sicilian pesto pasta meal kit, not only because of the delicious meal I made in no time at all, but also because it required very little prep. The only ingredients I used from my kitchen were a little olive oil and salt, plus some breadcrumbs. 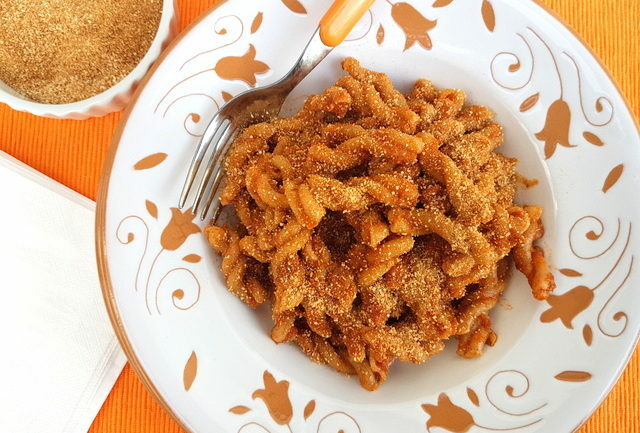 It’s very traditional in Sicily to sprinkle pasta dishes with toasted breadcrumbs instead of cheese. The kit comes with recipe instructions and tips on how to get the best results. My Sicilian hubby also loved it and described it as a taste of home! If you’d like to try this Sicilian pesto pasta meal kit just click on this link to check out the Us Authentic Italian Experience online shop. They ship to US, Canada and Europe! Use the coupon code THEPASTAPROJECT and get a 10% discount! If you do try this meal kit, I’d love to know what you think. 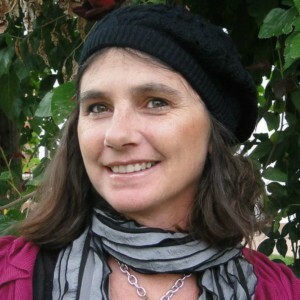 Please let me know by commenting here on the blog or on the Pasta Project Facebook page. I haven’t been compensated for writing this article and all opinions are my own but I may be compensated if you buy products through the links in this post. However, this helps me cover my blog costs and keep it going! A tasty Sicilian Hyblaean pesto and organic ancient grains pasta that comes in a kit and takes very little time to make into a delicious healthy meal full of Sicilian flavours. Put a pot of water on to boil for the pasta. When it starts to boil add salt and bring to the boil again. 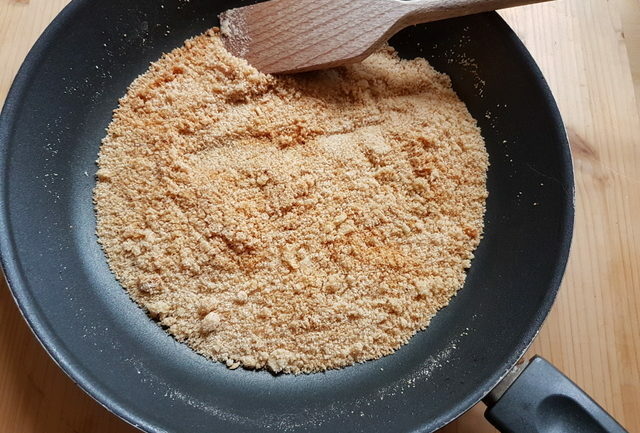 While the water is boiling, put 1 tbsp of extra virgin olive oil in a small frying pan with the breadcrumbs. 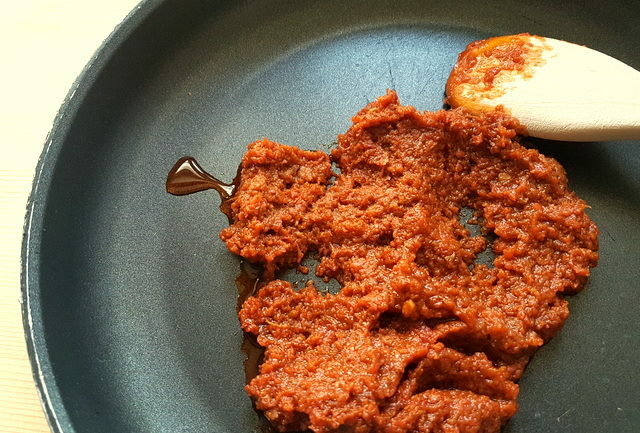 Cook over a medium heat, tossing frequently until crunchy and golden brown (about 5 minutes). Be careful not to let the breadcrumbs burn. Cook the pasta al dente according to the instructions on the packet. Pour the Hyblaean pesto into a pan. Add 4 tbsp of pasta cooking water into the empty jar, close it and shake. Pour the water into the pan with the pesto, stir well and warm the sauce over a low heat. Add some of the organic cherry tomato sauce to the pesto . Keep adding until you get the consistency and flavour you prefer. (I used it all) Stir well and cook for about 3 minutes. When the pasta is cooked save a cup of the cooking water and drain. 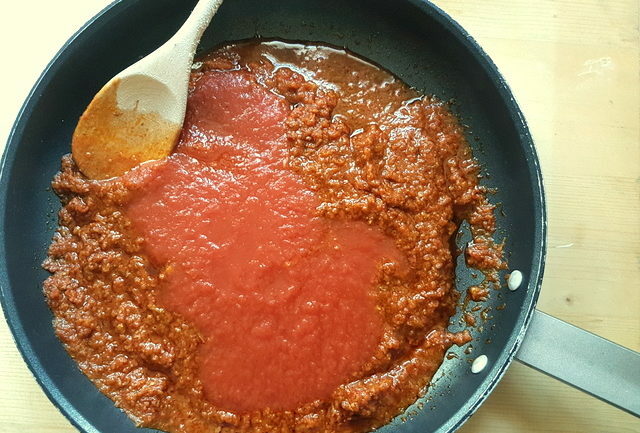 Add the pasta to the sauce and then mix it with the sauce and continue to cook on a low heat for about 1 min. If the mixture is too dry, add some of the saved pasta cooking water. Serve immediately sprinkled with toasted breadcrumbs. I had some leftovers as I used all the ingredients in the kit but there was just my hubby and I. I baked the leftovers with some slices of mozzarella and another sprinkling of toasted breadcrumbs. It was delicious too! What an amazing meal kit! This would make a great gift – and would save so much time in the kitchen, I’m sure! I bet it would help cut down on food waste too! Thank you Stephanie! Hadn’t thought about the benefit of cutting down on food waste but you are right! A great meal with very little wastage. In fact, I baked the leftovers the next day and so got 2 meals out of it! 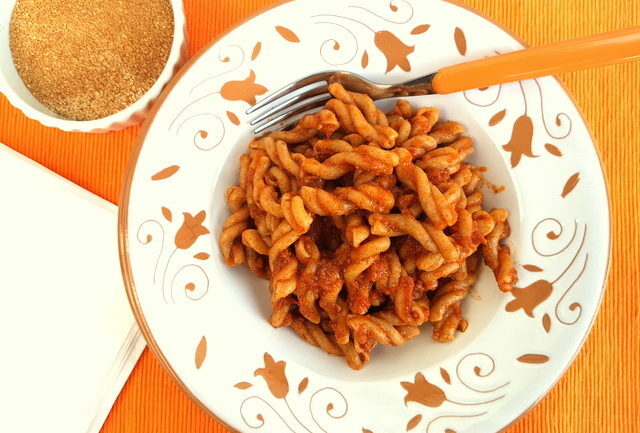 Ancient wheat grain pasta with sudried tomato pesto sounds like a great weeknight meal and such richness. The nutty pasta and umami laden pesto packing punches individually and sensationally combined. Yum! Thank you Kari, yes this combination of ancient grains pasta and pesto with sun-dried tomatoes and wild fennel is full of umami flavour. I really enjoyed it! THANK YOU SO MUCH FOR SHARING THIS! This is the PERFECT git for my Sicilian mother-in-law. I’m definitely ordering this for her for Christmas! Krista I’m happy you like this Sicilian meal kit. I’m sure your mother in-law will love it! This will be so handy for me specially when I do not want to do much. Readymade meals are a blessing at times to working people like me. And yes that pesto pasta looks too tempting and delicious. Thanks Renu, I agree there are times when having a meal kit like this is so handy. Plus it’s healthy too so that’s a real bonus! Sicilian food is so delicious. I need to get my hands on this pesto pasta meal kit. The dish looks wonderful and would be perfect for entertaining as well. I can’t wait to try this kit and the recipe. Sicilian food is my favourite Italian regional cuisine Mirlene, and not just because my hubby is Sicilian! Both the pesto and the pasta in this kit are really delicious! I LOVE ready-made meals! They make busy nights such a breeze! Plus, LESS DISHES!! Exactly Anna! And this kit has the added bonus of being made with healthy ingredients! I definitely need to check out this pesto pasta meal kit! It looks so convenient and delicious. Thanks for the heads up! I’m sure you will love this or any other kit the company makes Amanda. All their ingredients are organic and healthy! This looks so good! The fennel sounds like a great addition to a pesto, and those ancient grains pasta looks just like my thing! Thank you Stine! I love ancient grains pasta too. So healthy and the wild fennel is what makes this pesto in my opinion! I’m going to order some of these kits for Christmas gifts. I love that I can bring a little of Italy to my friends and families tables with a simple kit. Thanks for sharing! I’m sure your family and friends will love these meal kits Kelly! Italian food is such a great gift idea! I think Sicilian flavors are my favorite when it comes down to pasta. I have tried all kinds of Italian pasta – mostly thanks to your blog – but never really pesto pasta though! So excited to make it soon! 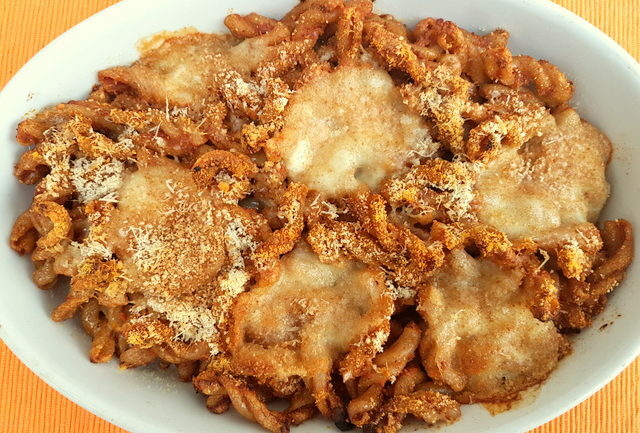 I also love Sicilian pasta dishes April. 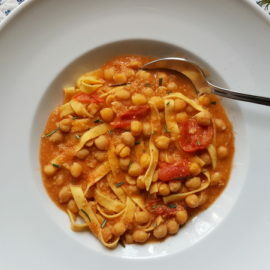 Such wonderful Mediterranean flavours! And this pesto is a delicious example of those flavours! What a tasty and fun meal kit! Great idea! I absolutely love all types of pesto! Thanks so much! I love all types of pesto too and the one in this kit was really yummy! Full of Sicilian flavours! Thank you Maddy! I agree this is a great gift idea especially for pasta and pesto fans! 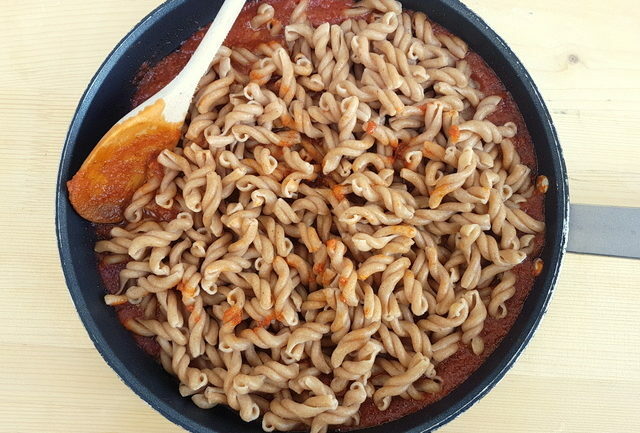 This does look really delicious – the pasta and the sauce both look lovely. Great kit idea! Thank you Gingey Bites! This is a super meal kit because both the pasta and the sauce are so yummy! What an awesome idea with tomato pesto. I absolutely love this meal kit and will be checking it out. Sounds like an awesome idea for a quick, healthy and delicious dinner. Also perfect as a gift! Happy you like the idea of this meal kit Edyta. I agree great gift idea for pasta lovers! The flavors in this pesto sound divine. I actually enjoy fennel, but don’t think about it a lot when cooking. This is something that would be great to have on hand for a busy weeknight when I don’t have a lot of time to cook. This is perfect for when you don’t feel like shopping and prepping Lisa! Plus it really is so delish and nutritious too! I’d say that having a meal kit in your pantry is a must, especially on those crazy busy days when you just don’t wanna think what to make for dinner! This one looks delish! Thanks Julia! Yes this is fab to have in your pantry. You can whip up a delicious and nutritious Sicilian dish in no time at all! Pesto and pasta is such a classic combination — and tomato pesto sounds really divine. I would love to try this — and how easy that it all comes in one convenient package. This would make an awesome Christmas gift for the foodies in my life! I love pesto and pasta too Lisa! And, I agree, this is a great gift for pasta lovers! Grazie Claudia! This is a super gift for pasta lovers! So easy to prepare and so delicious! This kit looks perfect for all my foodie friends for gifts. 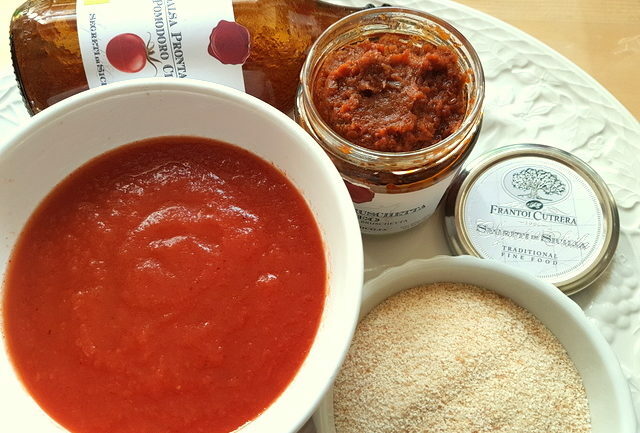 I totally agree that sometimes it is just so nice when you have a wonderful ready made sauce for those nights that cooking just seems a little too much! Thanks for sharing this awsome sauce. Happy you like this meal kit Bev! I really enjoyed it and want to get it again. A brilliant thing to have in the pantry! The pasta lover in me LOVES the sound of this meal kit. What a great gift idea for all the foodies on your Christmas list. I know I would love to get this…maybe I need to write a letter to Santa. I hope Santa will bring you one Gloria! Am sure you will love it! 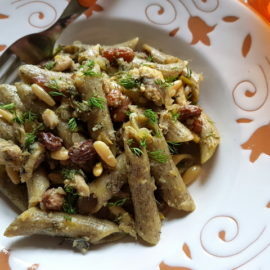 The sun-dried tomatoes and almonds, extra virgin olive oil and wild fennel sounds so good! What a fast and easy alternative to just picking up fast food. It is worth it to make this and take care of your body, every time. I agree Jeannette. This kind of meal kit is so much better than picking up fast food! Delicious and nutritious!